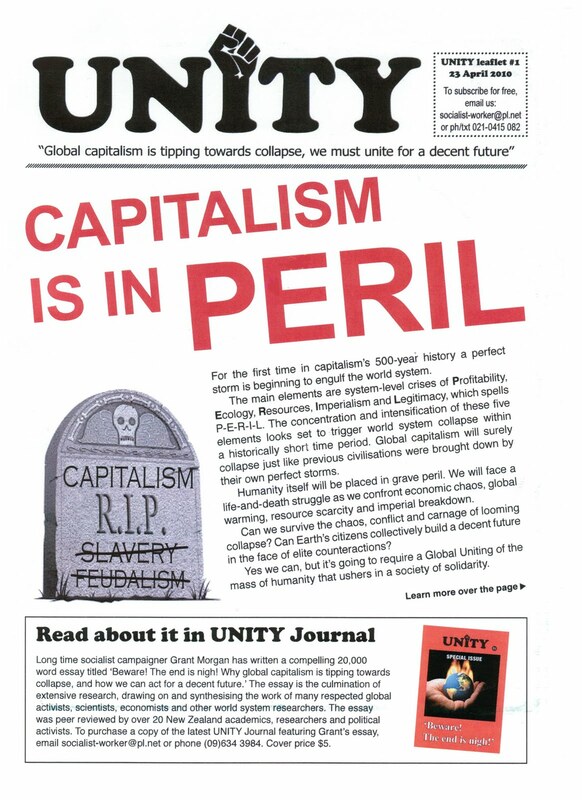 Click here to download UNITY leaflet on the theme of capitalism's collapse. It provides an introduction to the five crises besetting the world system: the Profitability crisis, Ecological crisis, Resource crisis, Imperial crisis, and Legitimacy crisis. The first letters of these five interconnected crises spells P.E.R.I.L, for capitalism and for us, if we don't unite globally to bring about a decent future. The leaflet draws from longtime socialist campaigner Grant Morgan's essay, 'Beware! The end is nigh! : Why global capitalism is tipping towards collapse, and how we can act for a decent future'. 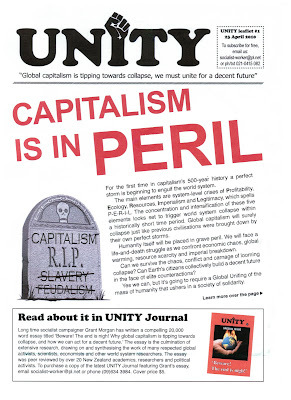 Grant's full essay can be read by purchasing a copy of the latest UNITY journal. Cover price $5. Contact Len, email office(at)sworker.pl.net or phone the Socialist Centre (09)634 3984.